The kind of photography I do begins as a moment of theft. Finding the scene, finding your angle, and stealing the moment for yourself. Some photographers are creators. They build a scene, a still life, or arrange their models and angle their lights and create an image from nothing. I’m not one of those photographers. I’m a thief. I case the scenes around me, plan my approach, take my shot, and escape back into the crowd. But I’m not an undiscerning thief. And over the years I’ve noticed a theme emerging in the scenes I’m capturing: I’m a photographer who wishes he could paint. When it comes time to take a photo, it’s not to Adams, Bresson, or Capa that my mind turns, but to Turner, Stubbs, Vermeer, Rembrandt, and Jan Steen. I am in no ways claiming equivalency. I am simply declaring the source of my inspiration. At my best I don’t want my photos to remind people of great photos, I want my viewer’s minds to think of great paintings. So those are the scenes I’m looking for. Those are the shots I’m trying to take. Painterly scenes, filled with painterly colors, populated with painterly subjects. The joy in the photographic hunt is in finding those scenes, those moments, that the painter gets to construct. Like any thief I’m hunting for that next score. It’s out there and I just need to find it and capture it for myself. Today I want to show you 4 examples of what I mean. 4 of my photos that remind me most of paintings I love. These photos are not recreations — they’re homages. They’re more about evoking the sense of genera then emulating a particular scene. And at the end, I want to finish with a new photo, taken with a new technique, directly inspired by the work of one of my favorite painters. It’s a photo that’s beginning to make me feel less like a thief and more like an artist. But first a horse and a cow. From when I first took art history in school I loved George Stubbs’ (1724-1806) portraits of horses. They were regal and powerful and I loved how the subject was almost always in profile. Similarly, I was taken with the paintings of Constant Troyon (1810-1865) and his focus on the pastoral elements of farm life, particularly his paintings of cows. Last year while driving through the Cairngorms on a dark gray day I stopped to take some pictures of a field of cows. After a few minutes shooting I saw him. He was standing perfectly still parallel to the road about 20 meters away. I knew what I wanted as I lined my shot up. 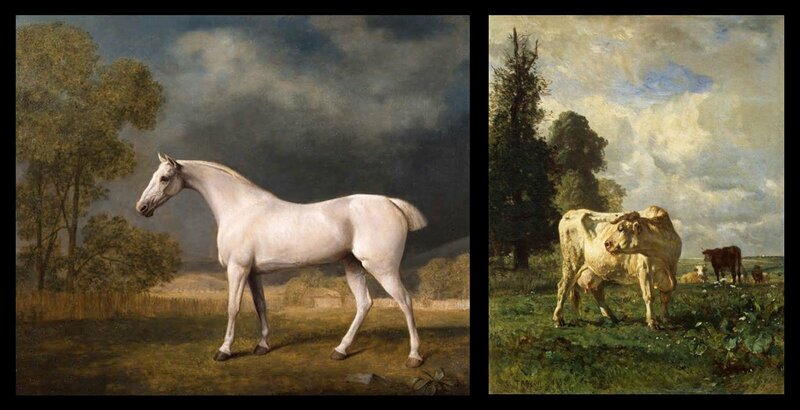 I wanted the perfect profile of Stubbs’ horses, and the bucolic context of Constants cows. I love this cow and I love this scene. The farm in the distance, the highland road winding up into the fog, the muted browns and greens and greys, and the cow just standing there in profile. It’s a photo I always enjoy coming back to. I’ve always loved Dutch interior paintings. I love the dark shadows, the active subjects who are all part of story that is unfolding in front of you, the 1000 little details that fill the scene, and the dogs that seem to crop up in some corner of nearly every painting. Last Autumn my wife and I were staying at an old tavern in the Yorkshire Dales. The stove fire was burning beside us. We’d just finished a heavy meal and were working on our drinks when a walker came in with her dog and the two sauntered over to the bar to get a pint. I saw the scene unfolding as a painting. The light was low and I had to work fast. I dropped my shutter speed to 1/30th of a second, stopped up to f/2, cranked my ISO to 1600 and had time for 1 shot. This is it. The sniffing dog, the woman reaching for her wallet, the bartender explaining what on tap, the drinks labels littering the wall behind, the signs and labels, and bottles, all cluttering into the frame. 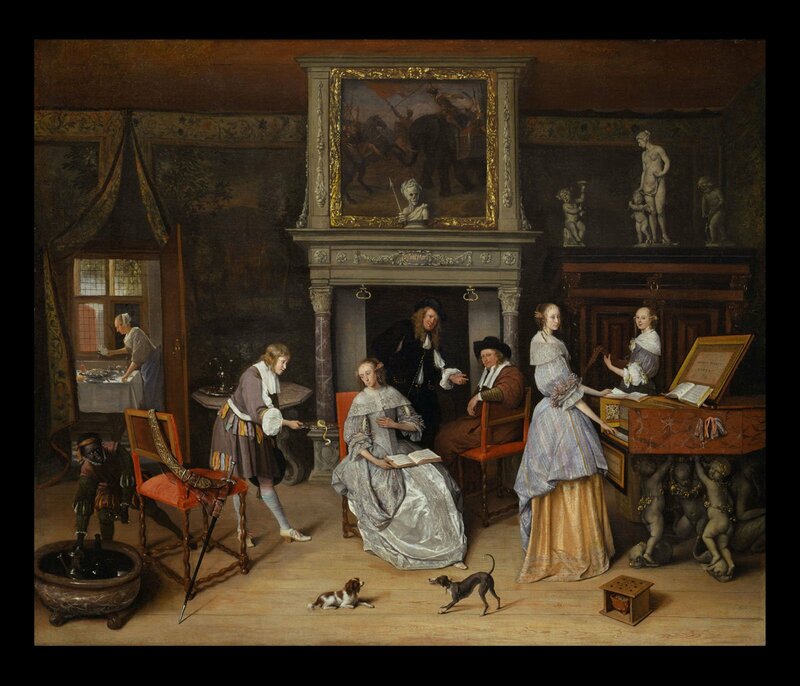 Similar to the tavern scene above but appealing more to the ordered domesticity of the upper class is Jan Steen’s (1623-1679) ‘Fantasy Interior’. I love the multiplicity of interactions and the separate conversations brought together by the room itself. The room here is a set, a stage for the everyday drama of domestic life. Recently my best friend got married and his reception was held in the beautiful Merchant’s Hall in Edinburgh. After supper and before the dancing I was wandering with my camera and came across a classic scene that immediately reminded me of the parlor room paintings of Steen. I flirted around the edges of the group, trying to frame the shot. After a couple of attempts, I got it. I love each of the pairs and the narratives that can be constructed around them. I also like how in this shot the presence of the photographer does not go unnoticed, just as in Steen’s ‘Fantasy Interior’, the subjects look as if they’ve just become aware they are being painted. The last of these frames brings us to Jacob Van Ruisdael (1628-1682) and Joseph Turner (1775-1851). Two seascapes, van Ruisdael’s depicting two guards on a pier pointing out to the rough sea in ‘A Looming Storm’ and Turners ‘The Shipwreck’ showing off the devastating power of the elements. The dark powerful sea in both is highlighted by the churning white waves. A bleak sky overhead adds to the ominous scenes below. Fortunately/unfortunately, I’ve not had the opportunity to capture any shipwrecks, but living by the North Sea provides no shortage of gray stormy days. Whenever the swell is up and the wind is from the North East, the waves crashing over the town pier are a sight to behold. Early this Autumn I headed down to the pier, sealed under layers of waterproof, to get up close and personal with the most recent weather system. I got some fantastic shots from the day, some of the water exploding many meters above both me and the pier before crashing down and rendering even the waterproof redundant. But one of my favorite shots from the day was of somewhat less impressive wave and a weathered older gentleman running to get out of the way as it crashed around him. There weren’t many on the pier that day willing to risk getting that close, but there he was, grey cap, grey eyes, grey jacket, grey trousers, on a grey pier, on a grey day. There’s a sense of danger and vulnerability, but also of courage in a place you generally wouldn’t look for it. It wasn’t the most arresting shot of the day, but it was the one with the best story. Finally, we come to something different. Photography clearly has the potential to catch the clarity and detail of a scene, just like a careful artist can construct it. But it wasn’t until recently that I saw photography’s capacity to do more than just steal. Like painting, photography too can create. Later in Turners life his work shifts towards the more conceptual, ethereal, and emotional. He’s less devoted to details here, and instead begins to convey the sense of a thing or space or scene. One of my favorites of this later work is ‘Rain Steam and Speed’ a depiction of a steam train crossing the Maidenhead railway bridge with the Thames below. It reminds me of how we remember things. My memory doesn’t work like a photograph. It conflates the senses, so that when I recall a moment I don’t so much see it as I remember what it was like to be in it. The sense of space and the prominence of landmarks coupled with the haziness of detail. And If I’ve been in a place more than once the memories bleed together so that various times and conditions and people meld into one. Last Spring I began experimenting with various techniques to achieve this more nebulous sense of memory in a photograph. What I arrived at is this. It’s a single exposure of over twenty exposures taken over 4 years from different points along the pier in St Andrews Scotland. The first time I saw this image was the first time I felt like an artist. It’s not that there is not artistry in photography, I hope I’ve shown just that in this post. It’s that stretching myself beyond the photography I was comfortable with has resulted in something different, something creative, something constructive. Like Turner, my tools haven’t changed. He was still painting, and I’m still taking photos. I’m just beginning to explore how the tools might be used differently. So while I still do steal moments for myself, and will always do so, I’m excited to take the first steps towards creating, and not just capturing, the sense of what I see around me. About the author: Spencer Bentley is a hobbyist photographer based in St. Andrews, Scotland. Originally from Canada, he’s working on finishing his PhD in Divinity. In addition to providing a creative outlet in the midst of his academic research, photography helps him slow down and see the world around him in fresh ways. You can find more of his work and writing on his website, blog, and Instagram. This article was also published here. Back to school: where and what did the top tech titans study?